After a year of running the blog, we finally did a long time planed upgrade. We chose to keep the same placement to make things less chaotic, so we hope you’ll easier get use to the new features. 3) Similar thing goes for commenting. But you still have the option to comment without logging in. Just fill out the comment form and that is it. 4) Most of the time went into transferring all the comments and users. But since that was really tricky part, there are bound to be difficulties. 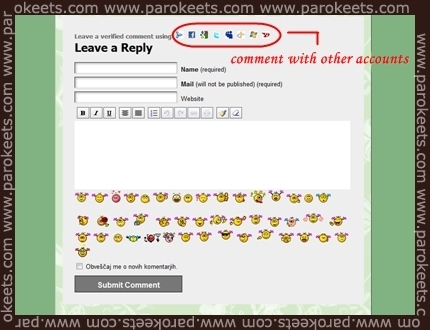 Pleas let us know if you experience any of the bugs at blog parokeets.com. I’ll write separate post about the more “fun” upgrades. Blog is little bit slower now – technology just seems to be unable to keep up wit us. If you have any problem what so ever pleas let us know. We were informed some of you had difficulties with logging in. 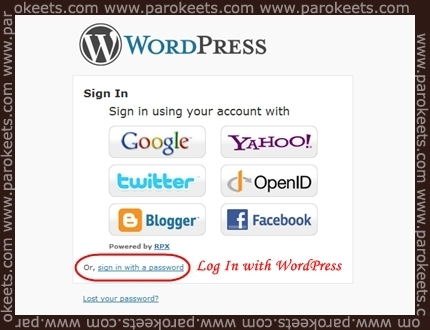 If possible, please send us you nickname (user name), which logging method failed and what kind of an error did you receive at blog parokeets.com. Every information will be really helpful.